Our Lone Star style plastic deputy badge with shiny gold finish. Also available in silver. 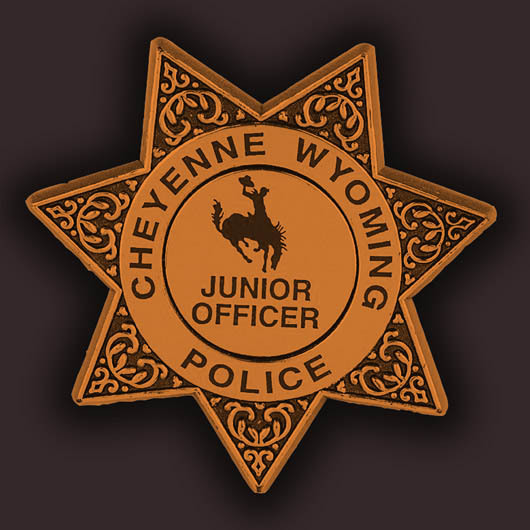 Our plastic police badges can be custom-imprinted with your message. Choose from 6 styles -- Shield, Justice, Commissioner, Lawman, Wyatt or Lone Star. And choose shiny silver or golden finish. We can imprint your custom message on the center of each badge, to help promote your organization. Pricing includes one color imprinting of your logo or custom message, free basic art layout, and free online proof. A setup charge may apply; see below for details. Additional imprint colors are available; please contact us for details. attaches with child-safe clip on back. Pin option available upon request; Pin option requires 1,000 quantity minimum. please request backside pin option in our online shopping cart's Special Comments section. need State or County seals? We have a large library with 100s of seals. Please contact us.